As the cooling began, more dense materials such as iron (Fe) sank into the core of the Earth, while lighter silicates (Si), other oxygen (O) compoun ds, and water rose towards the surface. In consequence distinct layers began to form. The layer of rock below the crust is called the Mantle. This is about 2,900km thick and contains most of the mass of the Earth. The upper part of the mantle is solid but at greater depths the heat causes the rock to behave more like a liquid. The high pressure, however, stops the rock from melting. It becomes 'plastic' at temperatures in excess of 1000°C and can flow. The rocks are mainly composed of iron (Fe), magnesium (Mg), aluminium (Al), silicon (Si), and oxygen (O) compounds. Below the mantle is the Core. This is probably liquid with a solid centre made of iron with a few other metals such as nickel. 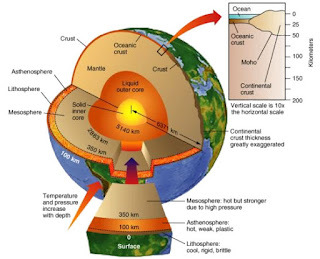 The centre, or Inner Core is incredibly hot, about 5,000°C and subjected to a pressure of about 4 million atmospheres! It is this extreme pressure that keeps the inner core in a solid state.